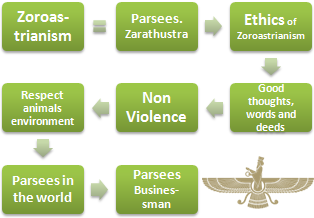 Syllabus of the Online Course (Subject): Zoroastrianism (Parsees) and business (India). 2- Case Study - Zoroastrian Business People. 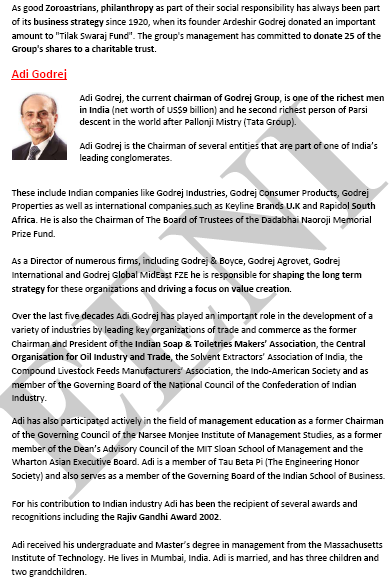 What do they share the owners of the TATA conglomerate, with the famous music conductor Zubin Mehta, with the top model Nauheed Cyrusi, with Freddy Mercuri, with Ardeshir Darabshaw Shroff (author of the Bombay Plan), with the owner of the largest brewery of Pakistan, with the prominent Indian family Wadia, PhD Poonawalla or with the Godrej Group? The common factor in all of them is their religion: Zoroastrianism, the religion of Zarathustra, the great reformer. The Parsees have played a major role in the creation of modern India. Today we can consider that the Gatha, part of the sacred books of Avesta, is surely the first ethical treaty of Humanity. “Good Thoughts, Good Words, Good Deeds” (3 H Zoroastrian). Everything created by Ahura is good, badness and goodness are generated in the human being, in his thoughts, and through their words converted in deeds. That is, the kindness should be practised in three areas: in thoughts, in words which express them, and deeds they generate. Perhaps this concept, together with respect for animals and environment and the principle of freedom that we find in the Gatha is a crucial contribution to our research for the principles of a global ethic. The principle of non-violence is large enough, and a vital significance for humanity. Moreover, is one of the global ethics principles. Derived from the principle of Non-Violence; we will find an enormous respect of the Parsees to animals and environment. Arising from the above principles, we can identify another feature of Zoroastrian ethics: honesty and uprightness (righteousness), the guarantee to achieve happiness. Justice is also a core value of Zoroastrian people. Perhaps the core of Zoroastrianism is the capacity of the decision ofe man between goodness and badness. 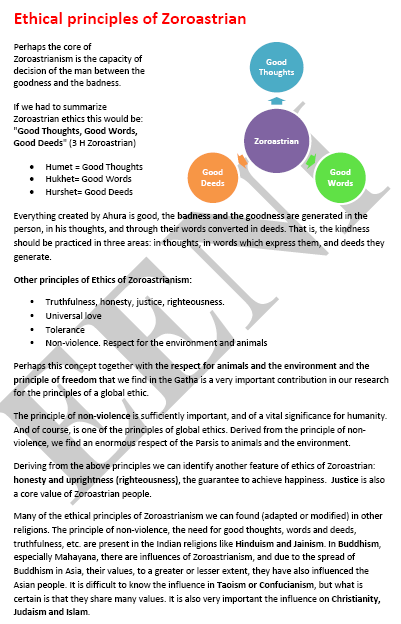 Many of the ethical principles of Zoroastrianism can be found (adapted or modified) in other religions. The principle of non-violence, the need for good thoughts, words, and deeds or truthfulness are present in the Indian religions like Hinduism and Jainism. In Buddhism, especially Mahayana, there are influences of Zoroastrianism. It is hard to know the influence of Taoism or Confucianism, but what is certain is that they share many values. It is also crucial the influence on Christianity, Judaism, and Islam. Followers: between 145,000 and 250,000. Some famous Parsees Businessman: Sir Dinshaw Maneckji Petit, Jehangir Hormusjee Ruttonjee, Ardeshir Darabshaw Shroff (co-author of the Bombay Plan of post-independence India, former Director of Tata), Byram Dinshawji Avari, Keki Dadiseth, or Minocher Bhandara.